This super healthy Winter Warmer deliciously delivers at least three portions of health giving veg. It has been specially formulated to be suitable for the 5:2 intermittent fasting diet which is big news in the health world this year. But if you’re not interested in that, add a little more olive oil and a handful of grated cheddar cheese at the last stage of cooking for extra yum for you and any little people you're feeding. It's creamy and naturally sweet with the cauliflower so even the fussiest of eaters will approve. Preheat the oven to 220C/200fan/gas mark 6. 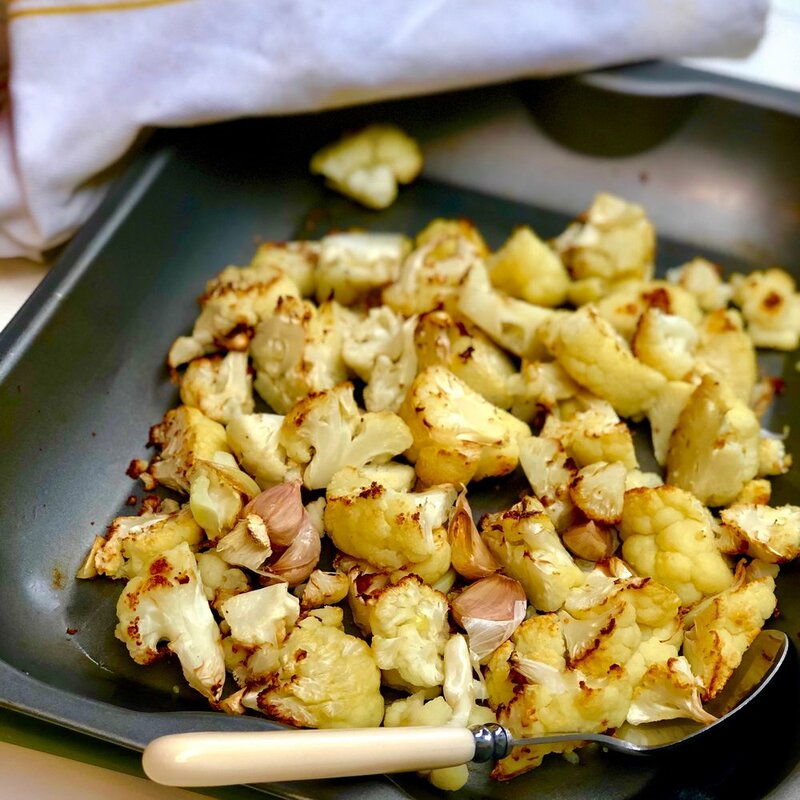 Place the chopped cauliflower and whole garlic cloves on a large baking tray and drizzle 1/4 tbpsn olive oil and season with salt and pepper and 1/2 tbsp fresh thyme and rosemary. Place in the middle of the oven and roast until just golden for about 20 mins. Heat the olive oil in a large sauce pan over medium heat, add the onion, leek and celery and saute until just translucent for about 3 or 4 minutes. When the cauliflower is golden, remove from oven. The roasted garlic should pop out of the skin easily, so add it to the pot along with the roasted cauliflower, bone broth or stock, the rest of the thyme and bring to a boil. Reduce the heat so that the mixture simmers and cook until the cauliflower is tender, about 20-25 minutes. Use a hand blender to blend until the soup is silky smooth, then check the seasoning and adjust accordingly. 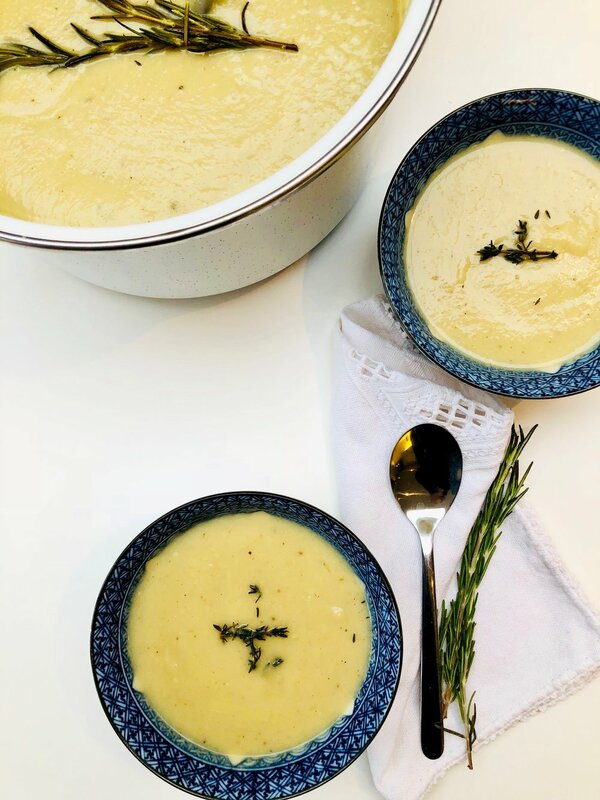 Ladle the soup into bowls and serve piping hot next to some crusty bread (or not, depending on whether you're taking part in the 5:2 plan) with a little sprinkle of fresh thyme. Top tip: You could also crisp up some kale in a frying pan for a few mins and serve the soup with that for some more texture....and extra green goodness for any little people eating this.